Business man Adrian, who runs recruitment and consultancy firm Blackberry Jobs, says the low cost and ability to be home “within 30 seconds” makes his new Garden Office in Wrexham, North Wales the ultimate base. The 62-year-old former chef from Gresford near Wrexham admits the final result “exceeded all expectations”. Adrian, who specialises in hotel and catering, rented offices in the past but after reorganising his operation began working from home a few years ago. However, when his mother-in-law needed to move into the extension at his home last year, was left without a dedicated place to work and a big dilemma. Instead of trying to find a costly rented office for himself and his team he decided to modernise his approach by letting his five staff work remotely then to build a Garden Office in his back garden near Wrexham. Rubicon Garden Rooms was able to offer him everything that he needed. The company creates bespoke top-of-the-range units in the UK used for everything from Garden Offices to hobby dens, teenage chill-spaces and annexes for dependent relatives. Adrian said: “I’ve reorganised my business to make it more economically viable to run, thus having less overheads, thus making the business extremely competitive. “I had a choice to rent more office space again or have one built in my garden. “I had to think to myself: do I want to go down the office route again? Do I want the hassle and huge costs? “I decided I didn’t want the stress so that’s why I did it this way. It really appealed to me. “There are no rates, no rents, limited costs and no travel. I can be home within 30 seconds - where else can I do that? “I’m always available to my clients whenever they want me to be. For instance, there was a case recently where I was able to dive in the office on a Sunday for ten minutes and deal with an issue for a client. “I don’t have to say I’ll have to wait until I’m in the office tomorrow, I can deal with it straight away and that makes them happy. “I’ve re-landscaped the back garden so the office is part of it but still separate. When I’m inside I feel like I’m in the office, not my garden. Adrian, who has many years’ experience of consulting in refurbishments and building operations in the hotel sector, praised Rubicon Garden Rooms and founder John Lyon for the quality of service he received. He said: “I looked at six or seven different companies and then I went to the Rubicon showrooms, and as soon as I saw what they were doing I wanted one! “I know a lot of people in project development and I’ve been around it myself, so I know enough about construction to know who is saying the right things and who isn’t. “John is so hands on. It wasn’t a case of I’m in a suit and I’m the owner - he was going to be in charge of the project and that was a big green light for me. “The materials they use in construction were what I wanted. I need something that I can use 365 days a year. “Due to the quality of the insulation I’ve not needed to have any heating on. It’s fantastic. It’s maintenance-free, the interior is completely plastered and you get to decide on the furnishings. “The way it was put together, nothing was too much trouble. I was sat in my conservatory watching the entire build. “I had a few questions about the construction and the workers answered them all, so I learned a few things along the way. 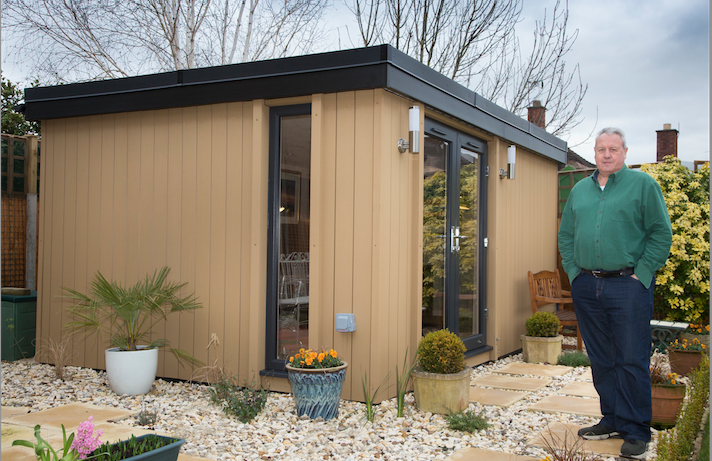 Rubicon Garden Rooms founder and managing director John Lyon said: “I’m delighted we were able to provide Adrian with exactly what he wanted and that his new Garden Office in Wrexham, North Wales has exceeded his expectations. “We’re proud of the quality of our product and aim to offer all our customers a first rate service.